Glover wanted to use her The Island in My Backyard expedition to show people how readily accessible — and relatively cheap — such a journey can be for those who live here. No flights or ferries to go on this trip. She didn’t even have to get in a car. … The Vancouver Island Trail — also known as the Spine Trail — is only 80 per cent complete, and even then “trail” can mean anything from a dead flat, three-metre-wide, groomed path to a never-trodden forest route only discernible by occasional markings on the trees. Then there were the gaps where forging ahead meant bushwhacking down 45-degree slopes. She had some funding from the Alpine Club of Canada for this adventure. 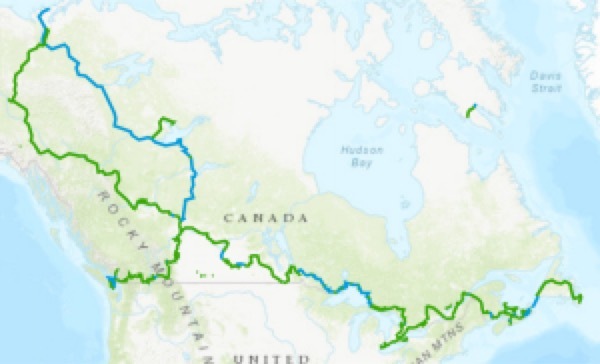 The Vancouver Island Trail is a multi-use (foot, cycle, equestrian) non-motorized trail, that links communities and ecosystems along a 765 km long, north-south transect of Vancouver Island. It uses both new and existing trails and inactive and active logging roads. At the start of 2018, it is still a work in progress with approximately 86% of it now complete. There’s an online hiking guidebook in the works. @TheHikingFool the first person to touch all three coasts on the Trans Canada Trail. “As much as I’m super excited to finish … I’m also excited to get home,” he said. Meise, originally from Sherwood Park, Alta, started his adventure in Cape Spear, Nfld. in 2008. The trip has not been all in one go. Only 2% of applicants get permits for the John Muir Trail, one of our top 10 hikes in the world, southbound. Odds are better in the other (more difficult) direction. This superb trip report is recommended for your planning. JMT northbound wasn’t the original intention. The start supposedly had to occur in Yosemite heading southbound and ending with the highest passes like most thru hikers do. Many proclaim southbound route trains you best for the harder climbs and higher altitudes. And yet northbound JMT took shape due to the permit limitations. Hence, northbound became the journey. The regular SOBO permits can be obtained solely through a lottery. You can apply 170 days prior to the start date of your choosing. Application form must be completed and faxed. For the SOBO permit, you must fill out your starting and ending dates plus your trailheads of preference. The instructions are straightforward but the chances of getting a permit are rather slim. You can learn more about applying via this website. Because we weren’t the lucky 2% who scored a SOBO permit, we ended up taking our chances on the unclaimed permits going NOBO via Whitney Portal. If you wish to go for overnight Whitney permits from the start, the application usually starts in February. See details on how to apply for Whitney overnight permit lottery here. We searched for permits on May 1st, when the unclaimed permits were released. These permits can be booked via Recreation.gov. To learn more, go to this site. If interested in doing the John Muir Trail yourself, check our JMT information page. The toughest trip yet for good buddies. My favourite gear shop — Mountain Equipment Co-op — got called out by one of their members. Do white people dominate the outdoors? Let that question sink in for a moment. If you consider every advertisement you’ve ever seen for skiing, hiking, climbing and camping, you might think that’s the case. … White athletes hold the spotlight in advertising, while the diversity that exists and continues to grow in outdoor spaces isn’t represented in the images we produce and promote. The truth is that we haven’t represented the diversity of Canadians or of our 5 million members. We’ve let our members down. We can’t move forward until we acknowledge our past. Historically, the models we’ve used in our catalogues and campaigns and on mec.ca have been predominantly white. And this imagery has perpetuated the vastly incorrect notion that people of colour in Canada don’t ski, hike, climb or camp. This letter is about recognizing the role we’ve played in underrepresenting people of colour in the outdoors, and committing to change. It’s not OK.
As CEO of MEC, I promise that moving forward, we will make sure we’re inspiring and representing the diverse community that already exists in the outdoors. This initiative isn’t about patting ourselves on the back. It’s also not about me, another straight white male with a voice in the outdoor industry. This is a conscious decision to change, and to challenge our industry partners to do the same. We know we’ve been part of the problem, and we’re committed to learning from our mistakes and changing the way we represent the outdoor community. Outside is for everyone. It’s time we acted like it. Check their new Diversity page. I’m proud to be a member and loyal customer of MEC.